Oh, the pain we go through for the show. 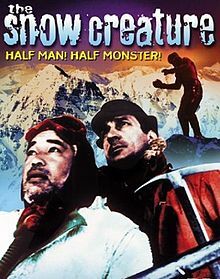 Last night, we watched the second of our movies about cryptozoological critters, Snow Creature. If ever there was a film ripe for a snarky commentary track, this is it. All the gory details in this week’s show, if we live that long. Previous PostRum and Coca Cola and ColumbiaNext PostLet the Pain End!